Adam: Legend (by which I mean Wikipedia) has it that the Old Quarter could “Comfortably accommodate 60 patrons” and that “More than 100 jammed into the room” for this week of shows in July, 1973. Now, being the middle of July in Houston, it was tremendously hot. Early on the album, Townes mentions something about the air conditioning being off, and how it’s really hot. Thus, this album is best experienced on a sweltering summer night with no air conditioning. In addition to the music (which I’ll discuss in a minute) the ambiance on this recording is second-to-none. During quiet moments in the performance, we often hear beer bottles clinking together, and at one point a telephone rings. These ambient noises do not detract whatsoever from the performance; they aren’t that loud. In my opinion, the extraneous noise adds to the performances, in part because it allows one to understand how quiet those hundred hot, thirsty people had to be to allow those faint sounds to be audible on the recording. At which point I realize that this album is perhaps the perfect accompaniment for this novel. Much of Townes’ music has restlessness at its core, just like Kerouac’s novel. Both also give one a profound sense of loneliness. Whenever I make someone listen to some of Townes’ music, I always tell them about how he was given electroshock therapy for depression when he was young, and as a result, his long-term memories were erased, and how I think that his not having any memories of the first 20-0dd years of his life is manifested in his voice. He always sounds distant, like he has some kind of otherworldly understanding of humanity. Anyway, so the music on this album is just great. Many of Townes’ best songs are included, his guitar playing is outstanding, his voice is in top form, and he cracks a few jokes in between songs. My favorite songs are the sad ones, like “Don’t Take It Too Bad,” “Two Girls,” “Why She’s Acting This Way,” and “Only Him Or Me,” which, on the surface seems to be about a relationship, but I think it’s ultimately about the passage of time. If the album has any weak point, it would have to be the talking blues songs. Not that they’re bad songs in and of themselves. They showcase Townes’ sense of humor and the breadth of his musical ability, but I typically skip them over when I listen to this album, because the talking blues song is not Townes’ forte. When it comes to sad, lonely songs about love, loss, and the passage of time, though, there is none better than Townes Van Zandt. There’s just so much to take in here, so much to process. Townes’s understated but goddamn lovely singing. His wicked deployment of imagery and syntax to create a world of longing and desire and strange beauty (as an English teacher I’m a big fan of “All the poets do push-ups/On carpets of rubber foam”). “Tecumseh Valley” stands out to me, as does “She Came And She Touched Me,” which enters Dylan territory with its absurd imagery, mystical feeling, and 6/8 time. But Townes’s song pushes the narrator and the singer into the background — where Dylan never retreats — and letting the song (melody & lyrics) come to the forefront. The songs and performances on this album are easy to lose yourself in, because they are use such simple means to cast a spell: a guitar, a few chords, a voice that hardly sounds like singing. Pretty soon you’ve run 4.3 miles and you’re ready for a cold Lone Star, a starry night, a trip to the cigarette machine (“upstairs”), and another spin or two of Live at the Old Quarter. Jordy: Most of the Townes discography was out of print for so long that you’re hard-pressed to find many fans who even have a favorite album. A lot of people simply forgot about this lanky, Tony Perkins lookalike. That’s a shame and, according to Steve Earle, mostly the fault of Townes himself. It is a tribute, however, to his songwriting and to the tireless ambassadorial efforts of Earle that Van Zandt has had a resurgence of late. And to all those burgeoning or potential fans: Live at the Old Quarter is the best collection of the man’s work and, without a doubt, his best live record. By the Summer of 1973, Townes (in his late 20s) had written the bulk of his greatest tunes. And the wonderful thing about the Old Quarter show was that he really enjoyed playing them and playing them well. His trademark understatement never sounds like boredom. Like one of his great influences, Hank Williams, Townes sings each phrase with a deep richness of emotion that rewards the attentive listener. I’m particularly fond of “For The Sake Of The Song” for its gentle finger picking and touching, flawless depiction of a doomed relationship. They’re all pretty perfect – all four sides: “Pancho & Lefty,” “If I Needed You,” To Live Is To Fly,” “No Place To Fall,” “Tecumseh Valley,” etc. And I’d like to defend the two talking blues tunes: I think they’re both pretty funny and fit in well with the jokes he tells during the set. I’m personally very relieved that Townes had a pretty sharp sense of humor. I find it very endearing amongst the gravity of his other songs. Live at the Old Quarter is recently available on two handsome, 180 g LPs at a reasonable price. Adam: Glenn, that’s interesting what you said about Townes retreating into the background of his songs and letting them speak for themselves, where Dylan never does that. I hadn’t thought of that before, but it’s very true. With Dylan, you’re always conscious that you’re listening to a Bob Dylan song. Dylan is/was such a huge personality and has such a large, rabid fan base that such self-conscious listening is probably inevitable. Dylan typically loads his songs with as many words as will fit, but Townes is able to say, with far fewer words and simpler imagery, at least as much as Dylan at his best . That’s not to say that none of Townes’ songs are (for lack of a better word) “Dylanesque.” “She Came And She Touched Me” is a good example from this album, as is “Fare The Well, Miss Carousel” from Townes’ self-titled 1969 album. 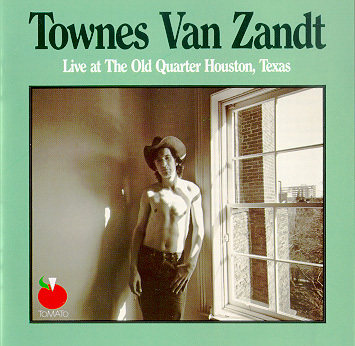 Perhaps part of the reason Townes is able to fade into the background of his songs is that the Townes Van Zandt “myth” is significantly less developed than the Bob Dylan “myth.” As Jordy mentioned, Townes was not very well-known during his lifetime. I recently read that he didn’t seem to care if his records sold at all (and to a large extent — they didn’t sell). Also, the fact that Dylan’s career has gone through so many permutations adds to his myth by making everyone constantly wonder who the real Bob Dylan is, while Townes was always just a guy with a guitar singing some really great songs. Finally, with regard to the talking blues songs, I do think they’re funny, but I guess I feel like they interrupt the flow of the sad, serious songs that I ultimately like better. That, and they’re really just simple songs that you can fully understand after hearing them once, so I don’t find them very interesting. With most of Townes’ other songs, I find the lyrics so interesting and the emotion so palpable that the songs reward repeated listenings, and I really don’t think that’s the case with the talking blues songs. Jordy: Not to jump on any sort of Joni Mitchell bandwagon here (her recent comments perplex and annoy me), but I’ll echo the above comments by saying Townes was a far more honest songwriter than Dylan. Dylan was more creative and prolific by many fold, but his songs came from somewhere very distant from Dylan himself. Townes’s writing was far more personal and, ultimately, more emotionally effective than Dylan’s. I’ll always be amazed at the volume, variance, and quality of what Dylan created but Townes’s tunes are infinitely more human. Glenn: See, we’re getting into iffy territory here. What, exactly, does “honesty” mean in music? Jordy seems to believe that it is synonymous with earnestness and self-revelation, which seems to me to be wrong. (Dylan’s songs can’t be called “personal” but he does cultivate a “persona” — is this sophistry?) At any rate, I have no answers to this question, but I’m curious about what readers think: What, if anything, does honesty mean in and for popular music? Adam: I tend to equate “honesty” in music with earnestness and, perhaps more so, with whether or not I can relate to a song. I feel a song is “honest” if it contains a true assessment of the human condition. But then, what is truth? Q: Is talking blues anyone’s forte? I have to say that the format is the least appealing one that I happen to own many renditions of. Can’t stand Luke the Drifter, or any of Dylan’s talkin’ ___ ____ ___ blues either. Really, if nobody is going to sing, can we at least have some interesting instrumental music underneath instead of poorly strummed open chords? Call me a philistine, but I really hate the format. As for Dylan, I think he’s actually quite honest a lot of the time–and I consider myself someone easily irked by put-ons (or at least the combination of earnestness and affectation–I do love The Fall, afterall). His earlier, folksier records are ones that I do think came from something quite personal, albeit perhaps outgrown by time of recording (do you hear him laughing all over “Ballad in Plain D”? )–specifically songs about trying on different identities, the folkie scene in NYC, and early romances. No one can look me in the eye and tell me that Bob Dylan doesn’t feel “Boots of Spanish Leather” or “My Back Pages.” He got back into the sincerity bag full-on with the divorce records in the mid-70s, I think, but even the ballads on “electric dylan” albums are pretty affecting. Still haven’t delved into TVZ, but certainly plan to. See, here is where I think we’re getting confused. Honesty means, “The truth as I believe it to be,” plus a certain straightforwardness. I seem to get into this argument every time I’m at a bar. Is that a “God Save The Queen” reference? I’ll say this much about Townes, though. There is something that rings true about his songs, perhaps truer than most other songwriters of his ilk (whatever that means), but I also think his musician persona is every bit as considered and perhaps just as calculated as Dylan’s. Clips from Heartworn Highways and Be Here to Love Me make me think it was the only way he got along in the world for as long as he did. That and the drugs. But I also think persona gets a bad wrap. Sure, it can slip easily into unruly pretension. But the person and the songwriter can never be the same, can they? People live in the world, while the songwriter lives on the page. It’s a smaller space, and they’ve got to pick and choose what can fit on it. Townes’s persona is no less believeable or honest or whatever else for being cultivated. But that’s what it is. To me, anyway.